Snow White Comic from 1938. This is such a pretty comic, I Liebe that they included some scenes that wheren't featured in the finished movie and that they changed the story a little bit and some of the Zitate :). 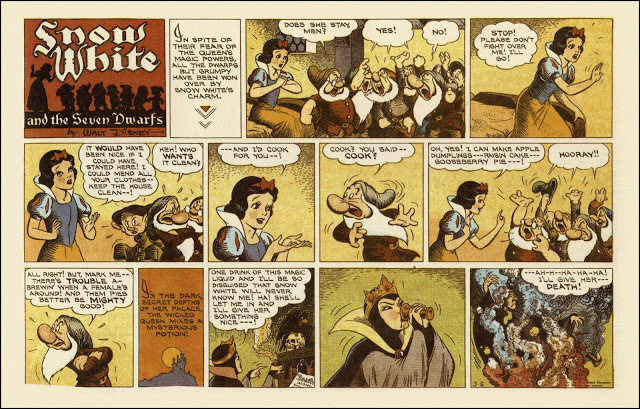 Wallpaper and background images in the Schneewittchen und die sieben Zwerge club tagged: disney snow white and the seven dwarfs comic 1938. This Schneewittchen und die sieben Zwerge fan art contains anime, comic, manga, cartoon, comic buch, karikatur, and comics.